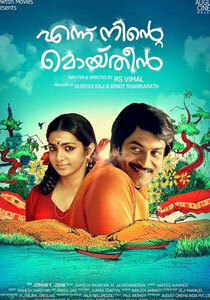 Ennu Ninte Moideen Songs Lyrics : Ennu Ninte Moideen is a 2015 malayalam film directed by Vimal and produced by Suresh Raj, Binoy Shankarath, Ragy Thomas & Dr. Suresh Kumar. The film stars Prithviraj Sukumaran, Parvathy, Tovino Thomas, Lena and Sudheer Karamana. Ennu Ninte Moideen Songs are composed by M. Jayachandran, Gopi Sundar & Ramesh Narayan and songs of this movie are written by Rafeeq Ahammed, Changampuzha Krishna Pillai & Mohammad Maqbool Mansoor. Songs of Ennu Ninte Moideen is beautifully sung by Vijay Yesudas, Mohammad Maqbool Mansoor, Gopi Sundar, P Jayachandran, Shilpa Raj and Shreya Ghoshal.